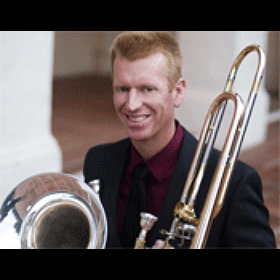 Dr. Eric Starr leads a multi-dimensional career as a Lecturer of Music and Performing Arts Internship Coordinator at SDSU, the Trombonist for Westwind Brass and the Executive Director for San Diego New Music (501c3). He enjoys teaching many courses in the School of Music and Dance including studio Trombone and Euphonium, Brass Chamber Music, Brass Methods, and Aural Skills I-IV. As a champion of contemporary music, Dr. Starr has performed with the International Contemporary Ensemble, Alarm Will Sound, San Diego New Music, Palimpsest, Renga, and Kallisti. He has premiered dozens of works and collaborated with composers John Adams, John Luther Adams, Christopher Adler, Caleb Burhans, Margaret Brouwer, Brent Dutton, David Lang, Lei Liang, Mark-Anthony Turnage, Lois Vierk and Chou Wen-Chung. Dr. Starr enjoys working with living composers and crafting seemingly strange notation and sounds into works of musical art. Dr. Starr has been a featured soloist with the SDSU Wind Symphony, the UCSD Wind Ensemble, and the InConcert Sierra Orchestra Panache. He has performed solo and chamber music recitals throughout San Diego including at the Athenaeum Music & Arts Library, Space4Art, SDSU, USD and the San Diego Central Library. National and International performances include the Ojai Music Festival, the Bang On a Can Marathon, La Paz Conservatory of Music (MX), Casa de la Cultura Mexicali, April in Santa Cruz, the Peabody Institute, the University of Cincinnati-College Conservatory of Music, Southwest Minnesota State University, the Cornelia St Café (NYC) and the Ventura Chamber Music Festival. His orchestral experience includes the San Diego Symphony, San Diego Opera, San Diego Winds, Broadway San Diego, La Jolla Symphony, Orchestra Nova, the Canton (OH) Symphony, Youngstown Symphony and the Orquesta Sinfonica UANL in Monterrey, Mexico. Dr. Starr is also heard on recordings for Westwind Brass, Bluegriffin Records, Dimension Films, the San Diego Symphony, the San Diego Zoo, City Music Cleveland and Super Bowl XXXIII. Growing up working on his family farm in northern California, Sierra Starr Vineyards, inspired Eric to leave the farming business but continue his family tradition of working hard in the field of his passion. He went on to study trombone with Steven Witser, Rick Stout, Michael Powell and Terry Cravens, earning a Bachelor of Music degree at the University of Southern California, a Master of Music and Artist Diploma at the Cleveland Institute of Music and a Doctor of Musical Arts at Stony Brook University with additional studies at the Aspen Music Festival and the Tanglewood Music Center. Eric lives in Ocean Beach with his wife, Sarah, where he is becoming a better cook while continuing his interests in fine wines and bodysurfing.